There's nothing quite as charming as a solid wood hutch. A wood hutch like the Amish Royal Mission 3-Door Hutch becomes an integral part of your home decor. With so much storage and display space, this hutch is a go-to spot for retrieving scented candles and special serving pieces. The grand cabinets offer room to house precious mementos and items that have deep meaning for family and friends to see. 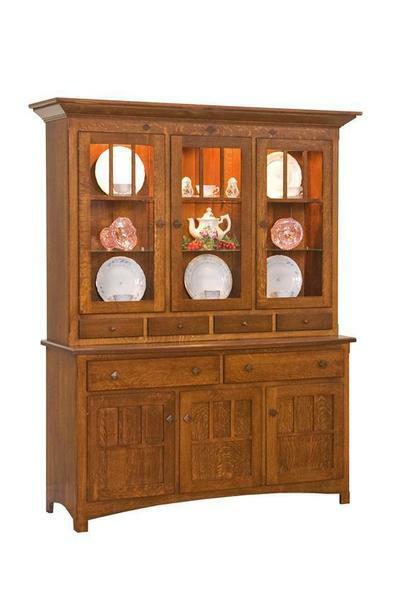 For dining room or living room, the Amish Royal Mission 3-Door Hutch is a piece of furniture that will draw attention. It's Amish made with integrity and its strength and beauty will shine for decades. Measures 63" wide, 21" deep and 82.5" high with a buffet height of 33"
DutchCrafters specializes in custom furniture. This mission hutch comes to your home with the exact features you select. For help in deciding, feel free to get in touch with a knowledgeable Amish Furniture Specialist. We can be reached by email at Questions@DutchCrafters.com or toll-free at 866-272-6773. Thanks for shopping DutchCrafters, the home of authentic solid wood furniture.